The Ferrari 250 GTO is widely considered the most beautiful car of all time. It is without question the most expensive car that has ever been sold at auction. On the rare occasion that a 250 GTO goes up for sale, it will easily fetch north of $20 million. Or more. 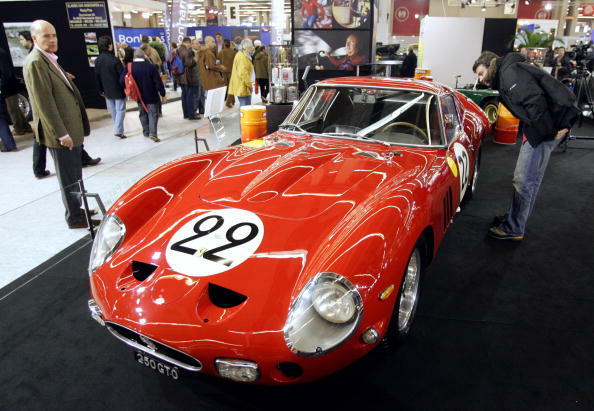 Just this past August, a 250 GTO set the world auction record when it sold for $38 million. That broke the previous record by $8.5 million (a 1954 Mercedes). There are unconfirmed rumors that secretive Spanish collector paid $52 million for a GTO in a November 2013 private sale. $52 million. For one car. The GTO is basically like the Mona Lisa of cars. Between 1962 and 1964, Ferrari produced a grand total of 36 250 GTOs. They were originally built to compete at the 24-Hour Le Mans and other high profile European races. Subsequent models were sold to consumers with a base price of $18,500. That's the equivalent of $145,000 today. Over the next several decades, GTO prices fluctuated from an all-time low of $2500 in 1969, to $48k in 1975, $180k in 1980, $300k in 1983, $500k in 1984, to $650k in 1985. One year later, a GTO broke $1 million for the first time. In 1989, a GTO sale broke $10 million for the first time. Prices dipped a bit in the early 90s. Some sold for as little as $3 million before prices scorched back in in the early 2000s. Barring some catastrophic economic disaster much worse than 2008 or the great depression, you will probably never see a 250 GTO sell for less than $30-40 million again. It's more likely that within the next decade, a 250 GTO will sell for $100 million. In our first version of this article, a few readers pointed out that we were wrong to say that Ferrari originally produced 39 250 GTOs and that only 33 are remaining. After doing some additional research, and reaching out to a friend who is an expert on these matters, it turns out we were wrong. But when you hear the explanation, you'll understand how we got confused. First off, between 1962 and 1964, Ferrari produced 36 250 GTOs. We initially stated that Ferrari produced 33. The confusion lies in the distinction between Series I and Series II 250 GTOs. Ferrari produced 33 Series I and three Series II. The three Series II 250 GTOs were produced in 1964 and came with a different design plus an upgraded chassis and engine. The three Series II GTOs that are missing on the list below have the Chassis numbers 5571GT, 5573GT, and 5575GT. Interestingly, #5571GT is currently owned by Bruce McCaw who is Craig McCaw's brother (owner of car number 6 on the list below). Chassis #5575GT is owned by Rob Walton (owner of car number 9 on the list below). Series II Chassis #5573GT is owned by someone named Pierre Bardinon, who we have not been able to research yet. To make this even more confusing, at some point in 1964, three of the original Series I 250 GTOs were taken back to the factory and re-bodied as Series II models. Those three are Chassis #s #3413 (car number 3 on this list), #4091 (car number 22 on this list), and #4399 (car number 14 on this list). And to make matters even more confusing, in 1964 Ferrari also produced a car called the 330 GTO that had the same exact body and chassis as the 250 GTO but a different engine. A total of three 330 GTOs produced, but the first 330 was scrapped by the factory to build the second one, so there are technically only two 330 GTOs left in the world. I so far have not been able to figure out who owns these two extremely rare vehicles. Please let me know if you have any tips! So who are the 33 lucky people who own the original Series I Ferrari 250 GTOs today? And how'd they get rich enough to afford the most valuable car in the world? Below is a detailed list of everything that is known about these incredibly lucky and wealthy current Ferrari 250 GTO owners. Some other fun facts: 18 of the 33 cars are located in the United States. Four are located in California alone. Four are also located in England. A scant three are located in their home country of Italy. One incredibly lucky collector owns TWO 250 GTOs, so technically there are 32 individual owners of the 33 cars. Not much is known about the owners of 250 GTO chassis #3223GT. We know their names and that they they paid $10.6 million for the car in November 2004. Historically, this car's most famous accomplishment was winning the 1966 Daytona 24-Hour race. Joseph Barone meticulously restored the car for several years after he bought in 2004. The car won several awards at the 2011 Pebble Beach Concours d'Elegance including the prize for "Most Elegant Sportscar". Bernard J. Carl started out as a real estate attorney. In the late 80s he made a name for himself in finance after becoming one of the leading experts on mortgage-backed securities on Wall Street. He worked for Solomon Brothers before being hired away by billionaire Texas investor Robert M. Bass. Today Carl is the co-founder of his his own firm, Brazos Europe Inc. Over the last decade, Brazos has invested in everything from Canadian oil, to natural gas in Chile, to a French luxury linens maker. In 2006, Brazos set up a $300 million fund to specifically acquire family-owned luxury businesses in France. Bernard Carl purchased his GTO in September 1997 for an undisclosed price. It is known that the previous owner, Dr. Ron Finger of Florida, turned down $3.75 million at some point in the late 90s and specifically wanted a minimum of $4 million. Take a wild guess how Greg Whitten of Medina, Washington earned his fortune? After graduating from the University of Virginia undergrad, Greg got a Ph.D. in applied mathematics from Harvard. He then got a job at a software company called Compucolor. At Compucolor, Whitten managed to pirate a copy of rival programming language Microsoft Basic. His pirated version was so perfect that instead of filing infringement charges against Compucolor, Bill Gates offered to forgive their transgression on the condition that Whitten come work for Microsoft. Whitten went on to work at Microsoft from 1979 to 1998. He eventually rose to the position of Chief Software Architect. Whitten's most important early-contribution at Microsoft was the development of the revolutionary programming language "GW-BASIC" for Compaq and IBM in 1983. There is some debate today as to whether the "GW" in the code's name stood for "Greg Whitten" ,"Gates-Whitten" or even "Gee-Wizz". After earning hundreds of millions of dollars thanks to Microsoft's enormous success, Greg Whitten became a noted vintage car collector. He reportedly owns dozens of cars including a Ferrari F40, F50, Enzo, 275 and of course a 250 GTO. He acquired his 250 GTO in 2000 for $7 million from the Chairman and CEO of L'Oreal, Sir Lindsay Owen-Jones. Greg's 250 GTO is one of the three Series Is that went back to the factory in 1964 to be re-bodied as a Series II. That's why this 250 GTO looks slightly different. Chris Cox is a private investor and philanthropist who lives in Chapel Hill, North Carolina with his wife Ann. He acquired his 250 GTO in June 2005 for an undisclosed price. The car was originally red, but was repainted blue and yellow as an homage to a Swedish driver who raced the car in the 70s. On July 6, 2012, Christopher was driving the car in as part of a convoy in France on the way to Le Mans to celebrate the 50th anniversary of the GTO. Other members of the Ferrari convoy included fellow GTO owners Pink Floyd drummer, Nick Mason, and businessman Sir Anthony Bamford. At some point on the way to Le Mans, one of the other GTOs allegedly rear-ended Chris Cox which push his car into an oncoming Hyundai minivan. Christopher's GTO was widely reported as being "totaled", which would have made it the most expensive car crash of all time. Those reports have since been downplayed, but the car was definitely damaged badly. Lawrence Stroll is a Canadian fashion mogul who is currently worth $2.4 billion. Early in his career, Stroll struck deals with companies like Pierre Cardin and Ralph Lauren/Polo to license those brands in Canada and Europe. In 1989, he teamed up with a Hong Kong businessman named Silas Chou. Silas and Lawrence developed the Tommy Hilfiger brand from a relatively unknown clothing line to one of the most successful brands of the last 20 years. The duo continues to work together, investing in companies like Karl Lagerfeld, Pepe Jeans and Michael Kors. Lawrence is arguably one of the most prominent Ferrari collectors in the world today. At one point when he was interviewed in 2012, his car collection included 25 Ferraris. In addition to his 250 GTO, he owns a 330 P4, a 1985 288 GTO, an F40, an F50, an Enzo and more. He acquired his 250 GTO in November 1996 for an undisclosed price. Craig McCaw is an extremely forward-thinking business person. After graduating from Stanford, he entered the family broadcasting/cable business. He eventually turned the company into the 20th largest cable carrier in the US by the early 1980s. Simultaneously, he began investing in the then brand-new cellular industry. In 1994, he sold McCaw Cellular to AT&T for $11.5 billion. The sale personally netted Craig $2 billion. Three years later when he divorced his wife of many years, Wendy McCaw, Craig paid out a $460 million settlement. It was the largest divorce in American history at the time. In March 2013, McCaw bought an especially rare 1962 250 GTO for a then-record setting $35 million. This particular GTO was originally made for British Formula 1 racing legend Stirling Moss. The GTO went on to have an impressive racing career that included the 1962 24 Hour of Le Mans and a few major circuit victories. After being retired from racing, the car became a hotly desired collectors item thanks to its color and extreme rarity. It's the only 250 GTO that was painted lime green. Baron Irvine Laidlaw is a Scottish businessman who has a net worth of $1.3 billion. The son of a mill owner, in the early 70s Irvine bought a small US publishing company and single-handedly turned it into the world's largest conference organizer. He sold his company, the Institute for International Research (IIR) for $1.2 billion in 2005. Since then he is probably more famous for being an alleged "Monaco-based UK tax exile". He has also donated large sums of money to the UK's conservative political party and a variety of charities. His car collection includes a Porsche 904GTS, a Maserati 250S, a Maserati 6CM and a Bugatti Veyron. He acquired his 250 GTO in January 2005 for an undisclosed price. Engelbert Stieger is a Swiss textile magnate. He founded a company in 1962 which today is known for producing high quality curtain and decor materials. Apparently there is a lot of money in the textile business because Engelbert has been able to acquire a very impressive car collection over the years. He purchased his 250 GTO in July 1988 for $4.2 million (roughly $8 million today). It's one of only two GTOs that were painted black by the factory. Rob Walton is the eldest son of Helen Walton and Walmart founder, Sam Walton. 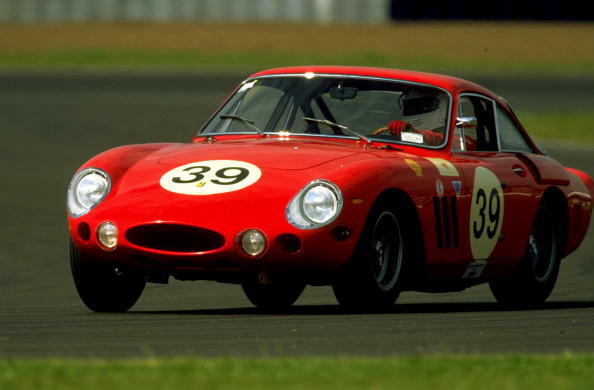 Walton's $38.5 billion net worth makes him the wealthiest 250 GTO owner on the planet. He owns approximately 12.6% of Walmart and as such is entitled to roughly $800 million a year in cash dividend payments. His car collection includes a 1965 Shelby Cobra, a 1964 Ferrari 250 LM, a 1960 Maserati T60, a 1961 Ferrari 250 GT SWB, a 1957 Ferrari 250 Testa Rossa and of course a 250 GTO. He acquired his 250 GTO in 1994 for an undisclosed price. Not much is known about James McNeil Sr of Staten Island other than the fact that he owns a 250 GTO. He purchased his 250 GTO in 1967 which easily makes him the longest consecutive owner of a 250 alive today. The price he paid is not known but is likely less than $10,000. Four years before taking ownership, his car crashed at a race in Nurburgring and was badly damaged. Ed and Leslie Davies are another pair of slightly mysterious GTO owners. They are frequently seen at car events dressed very casually, as if they just came from the beach. At a Florida car rally, a reporter managed to track Ed down for a very brief interview. When asked what he did for a living, Ed replied "Not much of anything." Their collection includes a 1957 Ferrari Testa Rossa, a 290 MM, a black Enzo, an F50 and many more. The Davies acquired their 250 GTO in 1994 for an unknown price. Take a wild guess how John Shirley of Medina, Washington earned his massive fortune. After attending MIT, Shirley worked for the Tandy Corporation from 1968 to 1983 at which point he was hired by Microsoft. He worked at MSFT until 1990 and served as a director until 2008. At his peak he was the President, COO and Director of Microsoft. In 2001, a Seattle newspaper estimated Shirley's net worth at $582 million, today he is worth close to $700 million. An avid collector, his high-tech, climate controlled garage houses more than 100 cars of significant historic value. His 250 GTO was purchased for $6 million in 1998. It had been previously painted white but is now back to its original red. Sir Anthony Bamford is a British businessman who controls the multi-national conglomerate JCB. JCB is the world's third largest construction equipment maker specializing in building machines for agriculture, demolition, digging, excavating and more. Anthony Bamford's net worth is $4.2 billion. Anthony "Tony" Wang is the former president of Computer Associates International Inc, also known as CA Technologies. CA Technologies was founded by Anythony's brother Charles Wang in 1976. Today it is one of the largest independent software companies in the world with annual revenue of $4.5 billion. CA Tech was the first software company in the world to achieve $1 billion in annual sales. The company is publicly traded on the NASDAQ and currently has a market cap of $13.7 billion. The Wangs were both born in Shanghai in the early 1940s at a time when the city was under Japanese occupation. The family moved to Queens, New York and eventually out to Long Island. Charles Wang co-founded CA Technologies when he was just 31 years old. Today he owns the New York Islanders hockey team. Tony Wang and his wife Lulu are avid Ferrari collectors. Beginning in the early 1980s, Tony stared buying vintage Ferraris, Alfa Romeos and Maseratis. And he wasn't just storing them in a garage, he was racing them all over the world. At some point in 1986, Lulu Wang decided she was sick of being a passenger during Tony's races. So she went out and did what any reasonable person would do. She bought herself a Ferrari 250 GTO. Not the one listed above. Lulu bought Chassis#: 4713GT which is listed here at #30. Apparently Tony wasn't satisfied borrowing his wife's car when he wanted to drive a 250 GTO, so in 1996, he bought himself Chassis#: 3769GT. Husband and wife matching 250 GTOs, why not!!?? Neither purchase price is known. There were also unsubstantiated rumors floating around the Ferrari world a few years back that the Wangs actually owned THREE GTOs. Those rumors may have started because the person who owns car #25 below is named Brandon Wang. In reality, Brandon is not related to Tony and Lulu. Not much is known about Hartmut Ibing other than he lives in Duesseldorf and that he bought his 250 GTO in 1976 for "tens of thousands of dollars". Remember in the opening paragraph how we mentioned that the Ferrari 250 GTO is the most expensive car ever sold at auction? Chassis#: 3851GT sold on August 14, 2014 for $38,115,000. 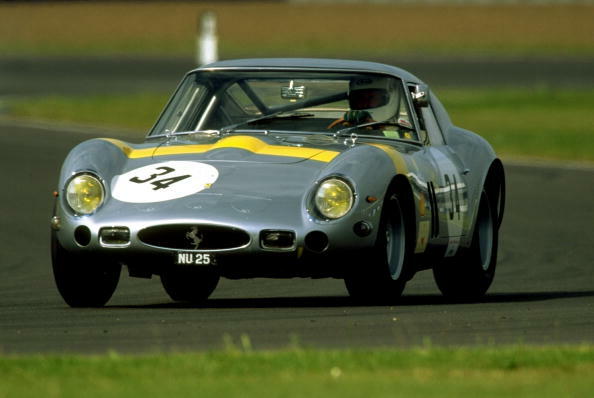 This specific 250 GTO was originally built to compete in the 1962 3-liter FIA GT World Championship series. Unfortunately, months before that event took place, the car crashed during a different race. The driver was killed and the car was badly damaged. The seller, Fabrizio Violati, had owned the car since 1965. The new owner, Carlos Monteverde is the son of billionaire philanthropist Lily Safra. Lily Safra earned her $1.2 billion fortune by marrying very well, four times. Her most lucrative marriage was to world famous banker Edmond Safra. Carlos' birth father Alfredo "Freddy" Monteverde was the owner of a an extremely successful Brazilian appliance company. Freddy committed suicide in 1969 and left his entire estate to Lily with the stipulation that the assets be managed by… Edmond Safra. Lily and Edmond dated for a number of years. In 1972 she married a man named Samual Bendahan, only to separate after two months. She married Edmond Safra in 1976. Edmond was killed in a fire in 1999 that was started by his bodyguard. Edmond left 50% of his fortune to charity and approximately $800 million to Lily. Giorgio Perfetti and his brother Augusto are Italian candy tycoons who have a combined net worth of $7.5 billion. Their father and uncle founded the company "Perfetti" in 1946. It was the first company to introduce chewing gum to Italians. In 2001, Perfetti acquired the Dutch maker of brands Mentos and Airheads for $900 million. As of today, the confectionery and gum maker employs 17,000 people via 30 subsidiary companies and distributes its products in over 130 countries. The press-shy siblings, who are Swiss residents, are no longer involved in any business operations. Giorgio acquired his 250 GTO in 1989 for an undisclosed price. John Mozart is a self-made entrepreneur who sold his first company, Eurasian Automotive Products, in 1979 to a company called SKF, which at the time was the world's largest ball bearings manufacturer. After selling Eurasian Automotive Products, John launched a real estate business. Mr. Mozart is a passionate collector who bought his first notable car, a Duesenberg in 1981. He built his collection very slowly and today houses 100+ significant classic cars in a private museum located right next door to the Silicon Valley Computer Museum. He acquired his GTO in 1998 for an undisclosed price. Charlie Nearburg earned his fortune as the founder of a Dallas-based oil and gas exploration firm that he appropriately called, Nearburg Exploration. But oil and gas was just a means to an end. Charlie's dream from a very young age was to become a race car driver. So when he finally had the means, that's exactly what he became. Charlie raced for many years in a variety of competitions and leagues. He drove the 24 Hours of Le Mans in 1997 in a Ferrari 333 SP. He retired from professional racing in 2004 after a respectable career. Charlie acquired his 250 GTO from California car dealership mogul Tom Price (who now owns car #31 on this list) for $26 million in 2010. Fashion mogul Ralph Lauren (current net worth $8.2 billion) has one of the most famous car collections in the world. His collection of 200+ cars includes pretty much every desirable vintage and contemporary car you could ever dream of. He literally owns dozens of Ferraris, with a special emphasis on those from the 60s, 70s and 90s. He owns a 1996 McLaren F1, a 1955 Mercedes-Benz 300SL Gull-Wing Coupe, a 1964 Ferrari 250 LM, a 1960 Ferrari 250 GT SWB Berlinetta Scaglietti, a 1955 Porsche 550 Spyder, a 1958 Ferrari 250 Testa Rossa… and many more. Way too many to list here properly. Ralph acquired his 250 GTO in 1985 for $650,000. That's roughly $1.5 million today. Peter Sachs's grandfather Samuel Sachs is the "Sachs" in "Goldman Sachs". After attending Harvard undergrad and NYU for business school, Peter somehow landed a job a Goldman Sachs. No idea how he pulled that off. He spent 37 years at the company before retiring as a director. At some point along the way, he began collecting and racing cars. Peter acquired his 250 GTO in 1981 through a trade. He traded his 275 GTB Speciale for the GTO which was owned by a Chicago company called Joe Marchetti's International Auto Ltd. Peter Sachs' 250 GTO is one of the three Series I models that was re-bodied as a Series II in 1964. Sir Paul Edmund Vestey is the third Baronet of England's Vestey Baronetcies. A Baron is a hereditary title of honor bestowed by a European King or Queen. The Vestey Baronetcy was created in 1921 for Sir Edmond Vestey (Paul's grandfather). Edmond was the founder of Blue Star Line, a British passenger and cargo shipping conglomerate. Edmond's great-great-grandson (Paul's second cousin) is Thor actor Tom Hiddleston. Paul acquired his 250 GTO in 1981 for an undisclosed price. Christian Gläsel is the Chairman of a private German company called Weidmueller which manufactures machines and production lines that are used by companies to build everything from cars, to refrigerators, to tablets. Weidmueller generated $800 million in revenue in 2013 and currently employs over 4600 people. The company was founded by Christian's great grandfather in 1850. Christian competed in the 24 Hours of Le Mans in 1999 and 2000 (he crashed in 2000). He acquired his 250 GTO in 2003 for an undisclosed price. Chip Connor's father founded "William E. Connor & Associates", a company that manufactures everything from garments and home textiles to furniture, toys and stationery. William Jr (Chip) took over the company in the early 1980s and soon moved the entire operation to Hong Kong. Today he is worth $1.1 billion. Chip acquired his 250 GTO in 2002 for a rumored $9 million. In 2000, a Ferrari historian called this particular Chassis "the very best Ferrari 250 GTO in the world with the most significant history. Additionally, despite being a pure race car, this GTO has never been seriously crashed or modified." Giuseppe Lucchini is the Chairman of the industrial conglomerate Lucchini RS. The company, which was founded by Giuseppe's father Luigi, specializes in building high technology steel products such as railway tracks. It generates approximately $300 million a year in revenue and is privately owned by the Lucchini family. Giuseppe purchased his 250 GTO in 1981 for an undisclosed price from British Formula One driver David Piper. I couldn't find much information about the "Lionshead West Collection". Whoever is behind the collection purchased the 250 GTO in 2013 from Swiss collector Jean-Pierre Slavic for a reported (but unconfirmed) $42 million in a private sale. See description under car #15. Tom Price is the Northern California car dealership mogul who we mentioned in the description of car #20. Price worked his way through the University of Colorado then got a job with Ford for 8 years. He bought his first dealership in 1976. Today the Price Family Dealerships owns and operates Volvo, Toyota, Land Rover, Aston Martin, Infinity and Jaguar dealerships in upscale Marin County (where I am from and currently visiting). He also owns dealerships in Sacramento and Sunnyvale. Carlos Hank Rhon is a Mexican businessman who has a net worth of $1.9 billion. Carlos was born to a family that controls 93% of the Mexican financial group, Grupo Financiero Interacciones. Carlos and his sons are also reportedly linked to corruption, money laundering, and the drug trade. Carlos purchased his 250 GTO in a 2012 private sale for $32 million. The car was recently involved in a traffic accident that left the front of the car severely damaged. Very little is known about the mysterious Torrota Collection of Spain. What is known is that the mystery buyer bought GTO chassis #5111GT in 2013. The buyer reportedly spent $52 million!!! That number has not been confirmed, but if it is true, that would make it the most expensive car of all time. So there you have it! This is officially the longest article I've ever written. It also took three straight days of writing and research. Hope you enjoyed it! Maybe someday enough people will visit Celebrity Net Worth to allow me to buy my own 250 GTO. Or at least pay someone to take me for a ride in one. The 1962 Ferrari 250 GTO, chassis no. 3413 GT is described by RM Sotheby's as having been "long considered to be the 'holy grail' of the collector car world." Yesterday an anonymous bidder smashed the record for most expensive car ever sold at auction. The prize? A 1962 Ferrari 250 GTO. The Price? Mind boggling.